first came to Hawai'i at age 8, when his mother married his stepfather Manuel Varez. After the war-torn Germany he'd known, it was love at first sight. Shunning publicity and working in the simplest possible fashion with linoleum blocks or canvas, Varez continually shaped his strong personal expression of Hawai'i. By nature Varez was a quiet and retiring man, he lived with his wife Linda (also a noted painter) in a remote rain forest setting near Volcano Village on the Big Island. 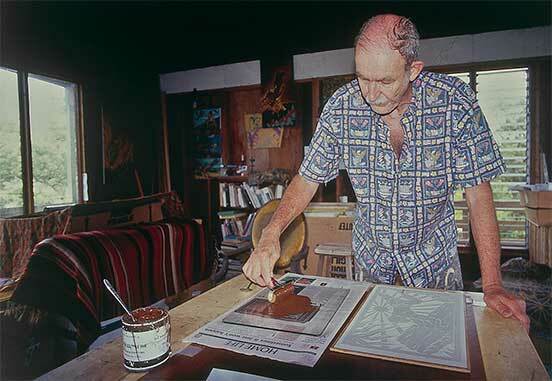 Dietrich was one of the Big Island's most beloved artists. The Hawai'i of old -- when spirits inhabited every tree and stone, and gods walked the earth -- was Dietrich's inspiration. His work boldly traced the adventures and passions of a cast of mythical characters he had carefully researched in legend. He lovingly and faithfully depicted Hawaiians practicing the arts, skills, and values of Hawai'i, old Hawai'i lifestyles and legends, in all of his prints, illustrated books, and vibrant oil paintings. Read articles from the '70's, glimpse Dietrich in his studio. Everything is custom printed, purchase the best size and quality for your home or office. Prints are produced by The Magic Mo, located in Volcano, Hawai'i. Which artist influenced Dietrich as a child? What is my Varez blockprint or screenprint worth? We get asked this almost every week! Typically, someone has owned a print since the '70's or '80's, or, it has been handed down to them and they wonder what the value is. The Magic Mo is not qualified to act as an art appraiser, so we really have no answer to this question. We can only suggest that you read through the articles about Dietrich, understand that he's been reproducing screenprints for decades, most of which continue to be sold today at very reasonable prices. Many times his dated prints can be found on ebay and other similar sources; check there to research what similar prints are selling for, or, check with an art appraiser. How did Dietrich get his web page?